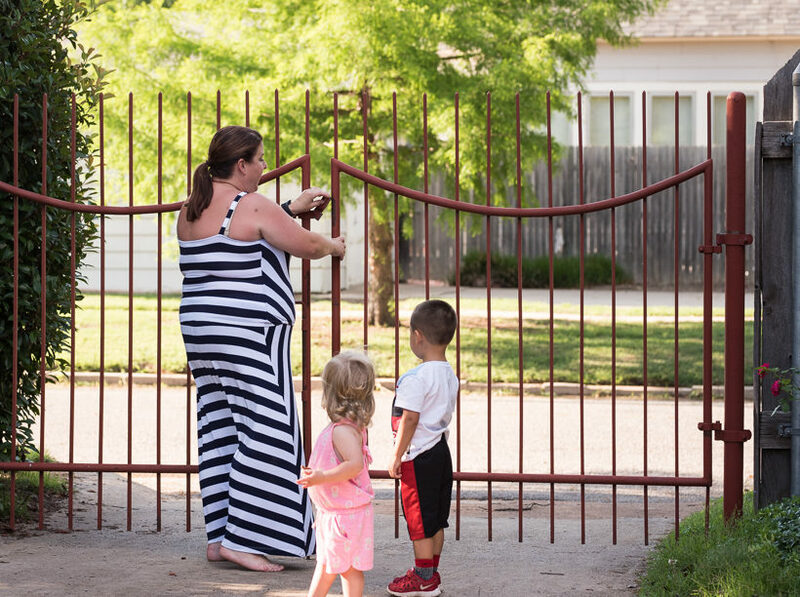 Keli Tointigh latches the gate in her backyard while the children she and her husband took into their care look on. The Tointighs agreed to foster the children after the DHS called unexpectedly last year and asked. It was 6 a.m. Las Vegas time when Keli Tointigh awoke to her cell phone ringing. The Chickasha resident was on vacation with her husband, John Tointigh, when an Oklahoma Department of Human Services employee asked if the couple would be willing to take in the children of one of Keli Tointigh’s cousins. The Tointighs had never applied to be foster parents. The following day, Dec. 30, the Tointighs were back home. And the cousin’s 1-year-old girl and 2-year-old boy were moved in. The Tointighs had never met the girl and had only seen the boy twice at extended family gatherings. Faced with a persistent need to find safe foster homes for children in crisis, but wanting to reduce the bouncing of children from home to home, human-services officials have turned to a new strategy: Find more relatives, friends or acquaintances immediately to take in the children. Don’t place them first in a traditional foster home. Don’t take them temporarily to a state-run shelter – the last one will be closing anyway. Reach out instead to families who have blood or other ties to the child or children, even if only indirect, and ask them if they’ll open up their home. The Human Services Department runs a quick initial background check and inspection, meaning DHS workers must scramble. The strategy, which picked up pace last year, comes with some risks – the most prominent of which is that an emergency kinship placement will cause state employees to overlook conditions or factors that might jeopardize a child’s safety. Keli and John Tointigh recall seeing their oldest foster child only twice before the Department of Human Services arrived with him and his sister in December. Placing children with relatives or other families connected to children is a long-standing practice. Kinship placements account for more than 3,000 of the 9,000–plus children in DHS custody. But last year the department launched a new protocol after an in-house evaluation showed that children in kinship foster care were less likely to move from one foster home to another, said Ledoux. Instead of placing children in shelters or with a foster family they do not know until DHS can find a permanent home, the department first contacts relatives, family friends, neighbors, teachers, coaches or church members recommended by the biological parents. Kinships are defined broadly as pretty much anyone to whom a child is familiar. 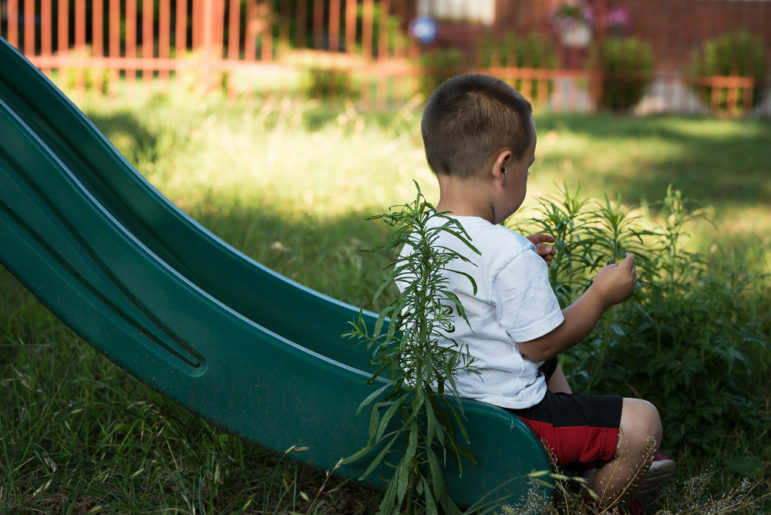 This year, nearly half of all children taken into DHS custody and eligible for foster placements have gone immediately to kinship homes – “first placement”, it is called – up from 35 percent at the end of 2016, department data shows. Unlike traditional foster families, who undergo extensive monitoring and must meet monthly requirements to remain active while they await placement of a child, kinship families have not been trained or fully vetted before the children move in. Once a family agrees to take them, the department begins an abbreviated vetting process that typically includes a criminal background check, searching the DHS database for any reports of abuse or neglect, calling references and a home visit to verify sleeping arrangements. This process is often done in a few hours. After the children are placed in a home, a more thorough investigation is conducted. The department looks at tax records, court documents, bank statements and other public records, and performs a deeper background check and additional home visits. Medical check-ups are required for children already living in the home. Adults in the house have 27 hours each of mandatory training before they can be officially approved, a process that typically takes three to four months. In some cases DHS has removed kids from kinship placements because of information brought to light during the formal investigation, but it is rare, Ledoux said. Families cannot receive financial compensation for the children until they are fully vetted and approved. The delay can cost families hundreds or even thousands of dollars. It took the Tointighs about four months to receive DHS approval. 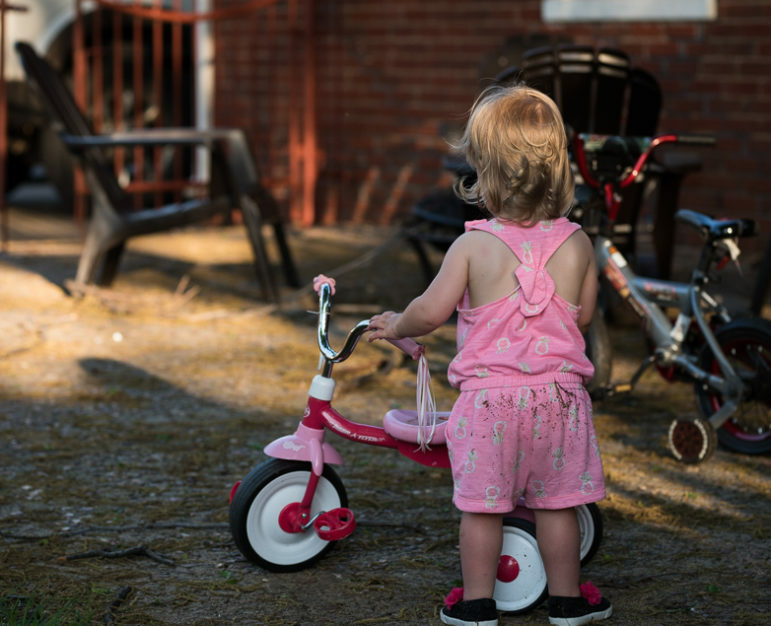 After the children moved in, the couple estimates they spent about $2,000 on furniture, clothes, diapers, sippy cups and other supplies and later were reimbursed $1,000 by the state for startup costs. The Tointighs expect the first regular payment later this month, six months after the children moved in. The children – the Tointighs ask that their names not be published – were were removed from their parents’ custody last year following reports of various family problems, Keli Tointigh said. They were initially placed with a close relative, who later told DHS she could not take care of them. They were placed in another kinship home, then returned to the relative until the Tointighs agreed to take them. Until December, the Tointighs had never considered becoming foster parents. They’re in their 40s. They have three kids of their own, two teenagers and an 8-year-old. They were on the downhill slide of parenting, looking forward to what comes next. But these kids were family. How could they say no? According to DHS, they were the last resort. The kids were running out of options. Keli Tointigh said she felt pressured by DHS during the initial call but it was ultimately the family’s decision and taking them in was the right thing to do. John and Keli Tointighs’ youngest foster child, shown playing in the backyard, cried inconsolably off and on for weeks after she was dropped off by DHS at the Tointighs in late December, Keli Tointigh says. But she grew happy as she settled in. She was 15 months old when she arrived. Often families chosen for kinship placements already have a relationship with the kids they’re asked to foster. Children in DHS custody are more successful when they maintain connections with their biological families, their cultures and their communities than when they’re placed with strangers, Ledoux said. Keli Tointigh was never close with her cousin. They ran with different crowds and only saw each other at extended-family gatherings. Keli had seen her cousin’s son twice at family celebrations. She had never met her cousin’s daughter before the siblings were dropped off at her house by DHS. They shared DNA but they were effectively strangers. 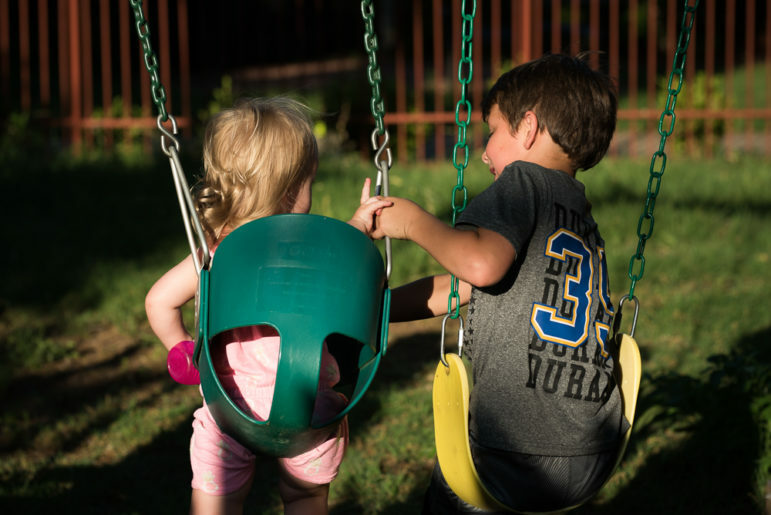 Maris Tointigh, 8, sits next to his 1-year-old foster sister on a swing in their backyard. Maris gave up his bedroom to make room for his new foster siblings when his family took in the children in December. Maris got his bedroom back when the Tointighs purchased a larger house in Chickasha to accommodate their expanded family. Following several weeks in a cramped three-bedroom house, the Tointighs, now a family of seven, moved into a larger home in Chickasha. The couple said raising a toddler and a 1-year-old is more difficult now than it was with their biological kids. There are more kids in the house, for one thing, and developing a routine that accommodates teenagers and toddlers has been challenging. But they’re learning and it’s already getting easier. While they don’t promote the fact that they are fostering, they are up front with others about the youngest being foster children. The Tointighs find comfort in talking to other foster families whom they meet at baseball tournaments and in their new neighborhood. The shared experiences and frustrations are comforting. The family is preparing to go to court later this year to officially adopt the children after attempts to reunify them with their parents failed. The custody battle is creating animosity among some of Keli Tointigh’s extended family members, she said. Reach Whitney Bryen at wbryen@oklahomawatch.org. Since 2012, the number of child care facilities has dropped by nearly one-quarter, putting parents in a pinch as they try to find places to take their kids. Industry representatives blame excessive regulation and subsidy income limits that exclude many parents who still struggle with the expense.